Maitripa (Skt. ; Tib. མཻ་ཏྲི་པ་, Wyl. mai tri pa) (1007-1078?) was one of the great mahasiddhas of India, and a disciple of Naropa and Saraha. He found Distinguishing Dharma and Dharmata and the The Sublime Continuum of Maitreya. 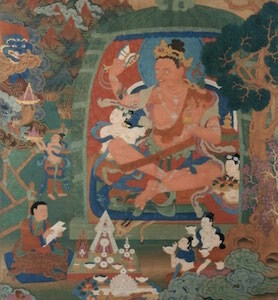 Maitripa is an important figure in Tibetan Buddhism because he was one of the main teachers of Marpa Lotsawa and Khyungpo Naljor who brought his lineage of teachings to Tibet. This page was last edited on 17 May 2018, at 04:14.